Good day to all and welcome to Leisure Lane. I hope you are enjoying the day. 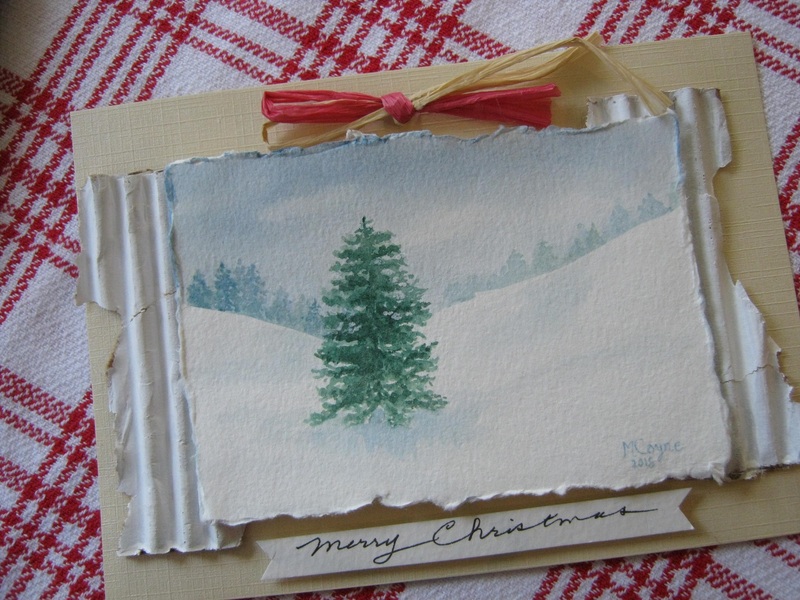 I’ve been making some Christmas cards and thought I’d share some with you today. I did the above card for my son. I like the way it came out, but my writing leaves much to be desired. I practiced and practiced on scrap paper, but when it came time to write in on the actual card, my flow choked, and well…but, I think he’ll like it anyway. I painted the tree separately, then added it to another piece with a splattered paint border. 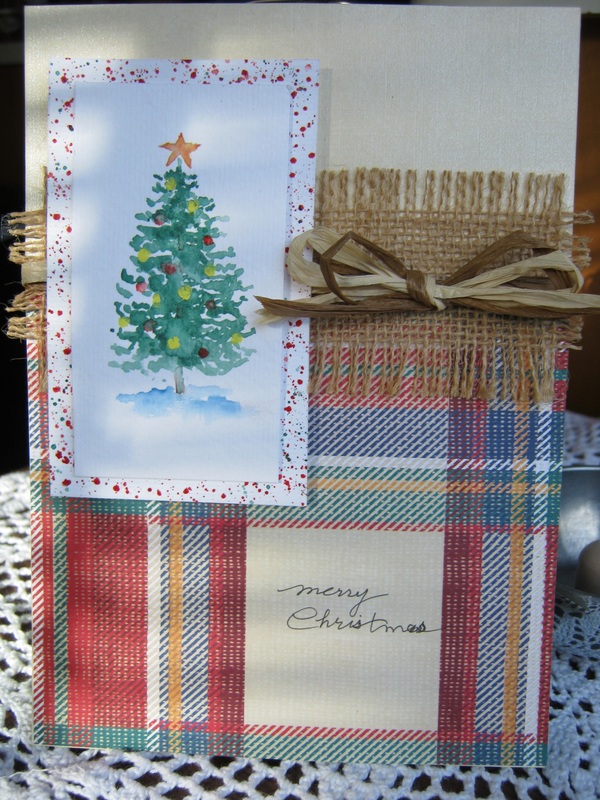 I was looking to create something I could use with this pretty plaid scrapbook paper. Overall, I really like the way it turned out. Made one for his dad with a different painting, and I’ll share that one soon. In a recent post I mentioned I got started with making the cards because of a friend in El Paso. I decided to send him the Snowy Christmas Card. If you didn’t see that post you can view it here. 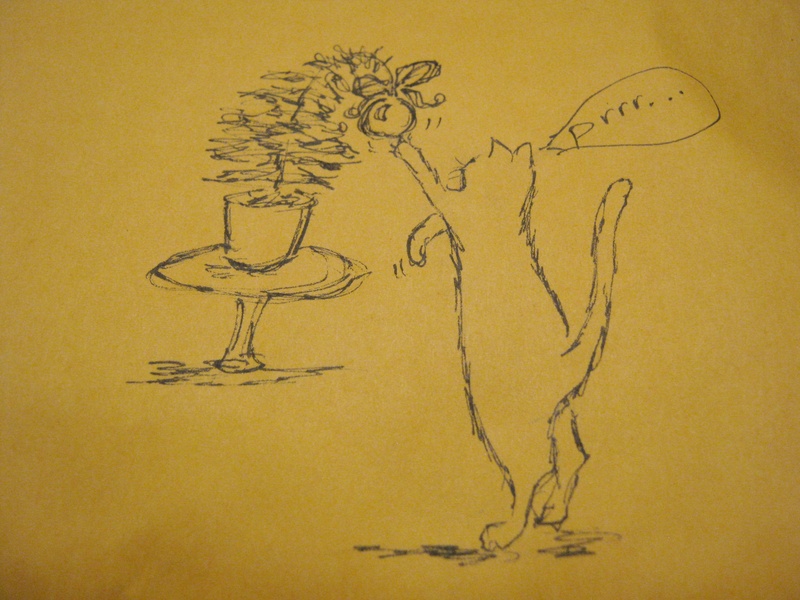 It’s already to mail off, and on the envelope I added a little extra something – he has a cat, so I think he’ll appreciate this sketch. I’m hoping it will bring some cheer the mailman, as well. Hmm…maybe another Christmas card there, too. Giving this card to a friend – it’s sort of her Christmas present. I first painted the watercolor and tore the edges. Then mounted it on painted corrugated cardboard using those 3M mounting sponge stickers – they are perfect for giving that raised effect. I mounted a “merry Christmas” tag with the same 3M stickers and added a raffia half-bow on top. Simple, but sweet. We rarely get snow here, so this will give her the desired Christmasy effect without the slipping and sliding ;). But Oh, to be sledding down that hill!